The King Street Giants “California Trad Jazz & more. 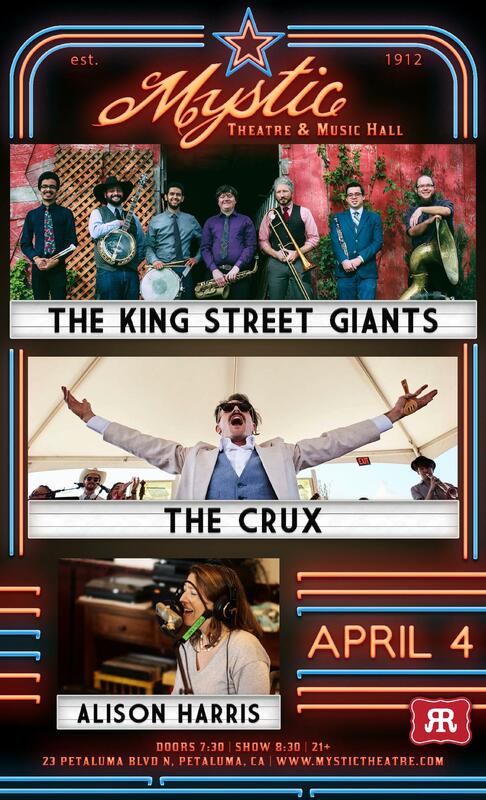 No trumpet required.” For the past 6 years the Sonoma County-based group, The King Street Giants, have brought their own special version of New Orleans music to the Bay Area. Whether they’re playing in clubs or on the streets, The King Street Giants are infamous for radiating an infectious energy and always having a blast. While continuing to play the music of their heroes (Louis Armstrong & The All Stars, Preservation Hall Jazz Band, Thelonious Monk, Jackson 5), they have also been writing original music in an effort to continue to evolve the idiom of Traditional New Orleans Jazz. The Crux is a mad scientist’s music laboratory, where songs are presented as theatrical experiments with an odd and beautiful intensity... Lullabies to drink your morning coffee to. Gospel songs for the faithless. Pirate shanties for people who get seasick. Swing music for the graceless. Alison Loraine Harris began writing songs at age 13. Her music explores strength through vulnerability, inspired by timeless melody, rich harmony, love, lust, community, and natural beauty. Alison’s debut record “Smoke Rings in the Sky” was released in 2008 on family record label Omega Records. Her sophomore album, "Walker Road", was recorded live and analog at the historic Walker Road Schoolhouse building in Two Rock, California with Americana Band The Barn Owls. She is currently working on "Form of Flight", a piano and vocal based cover album of The Mother Hips' songs with Tim Bluhm (The Mother Hips), Pat Sansone (Wilco), and Dave Schools (Hard Working Americans, Widespread Panic).